An hour-long voyage from Mumbai by ferry will take you the island of Elephanta where the seventh century rock-cut cave temple has the potential of appealing to the sense of sight of the hordes of the visitors who throng to them. 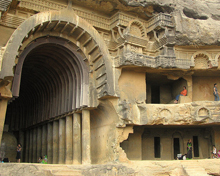 These painstakingly hewn cave shrines from the basalt rock were included in the list of World Heritage Sites in 1987. The cave temple of the beautiful island of Elephanta is in the same style as those of Ellora, near Aurangabad in Maharashtra. They are known for their brilliant sculpture. The main temple dedicated to Shiva contains a fine series of deep reliefs. However , the crowing achievement of the temple is the colossal Trimurti figure (6.1 meter high) of Shiva, one of the finest sculptures of ancient India. The three headed bust of Shiva depicts him as the destroyer, creator and preserver of the universe. There are other beautiful sculptures depicting different forms of Lord Shiva. Left of the Trimurti figure is another beautifully sculpted panel depicting other form of Shiva, Ardhanarishvara, a figure Half Shiva and half Parvati representing the union of opposites. 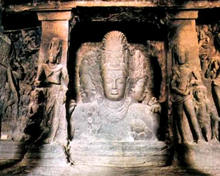 Other prominent sculptures of the Elephanta cave shrines are Nataraja (lord of dance), another aspect of Shiva where he takes resort to cosmic dancing, Ravana shaking Mount Kailash and Shiva slaying Andhaka. Earlier known as Gharapuri (fortress city), the Elephanta Island was renamed by the Portuguese, because of the huge rock-cut black stone statue of an elephant which is now installed in the Jijamata Udyaan in Mumbai. Nothing can be said about certainty about the builders of the Elephant cave temple complex because the area was under the control of various dynasties including the Chalukyas, the Kalachuris and the Rashtrakutas. Many of the panels were damaged by the Portuguese which once held its sway in some parts of India. Apart from the mesmerizing cave shrines, the Elephant island provides an opportunity to view the Mumbai’s skyline. Elephanta Festival is held here every year in February. In order to reach Elephanta caves, board the launches which head to Elephanta island from the Gateway of India every half-hour. The caves are closed on Mondays. Mumbai is the nearest airport which is 20km away from Gateway of India. Nearby railheads are Churchgate and Chhatrapati Shivaji Terminus (CST).